I recently wrote about our chickens first attempts at laying eggs in my Pullet Eggs post. Of course, nothing remains static. Our nine pullets are laying four eggs on average every day now. That number will increase as spring approaches because the number of daylight hours is increasing. Depending on which source you use, chickens require somewhere between 12 and 14 hours of daylight in order to lay eggs with any frequency. There are some interesting things to consider beside the number of hours of daylight, however. For example, some chickens are winter layers—they are significantly less affected by the number of daylight hours than other breeds. Our Delaware pullets seem to lay eggs nearly every day. The Ameraucanas are less affected by the lack of daylight, but they lay only every other day. The Black Australorp is laying few eggs (about one a week) because she’s not a winter layer. The Buff Orpingtons naturally lay fewer eggs than the Delawares or Ameraucanas, so it’s hard to tell much about their laying capacity in the winter. We’ll learn more as time progresses. The weather seems to have less to do with egg laying than the number of daylight hours does. Our chickens seem to continue producing eggs at a regular pace no matter what the outside temperature might be. This past week has seen some extreme cold, but the chickens continued laying. The coop is unheated, so we checked for eggs regularly to keep them from freezing. We also kept the chickens in the coop on days where the daytime temperature was below 20 degrees Fahrenheit. Hen health is important for getting good eggs though, so we make sure our hens have enough of the right sorts of things to eat. Because this is winter and there are no bugs for our hens to eat, we make sure that they get plenty of high protein food sources. The hens also get greens and other kitchen scraps. Sometimes they look quite funny running around with bits of fruit in their beaks. Along with all of their other food, we do provide them with layer mash—a necessity to ensure they get enough calories to survive the cold temperatures. We also had something interesting happen with our Black Australorp this past week. She laid the largest double yolked egg I’ve ever seen—it wouldn’t even fit in the egg carton. After I saw the egg my wife brought in, I decided to check our hen to make sure she hadn’t been damaged by laying it, but she seemed just fine. Double yolked eggs are somewhat rare, about 1 in 1000. One this size must be rarer still. I wish I had gotten a picture of it, but we ate it before we thought to get a picture. Unfortunately, it will be a long time before we get another. Our pullets will turn into hens soon. Each day the eggs get a little larger and we’ll soon have jumbo-sized eggs. The eggs are about medium in size now. 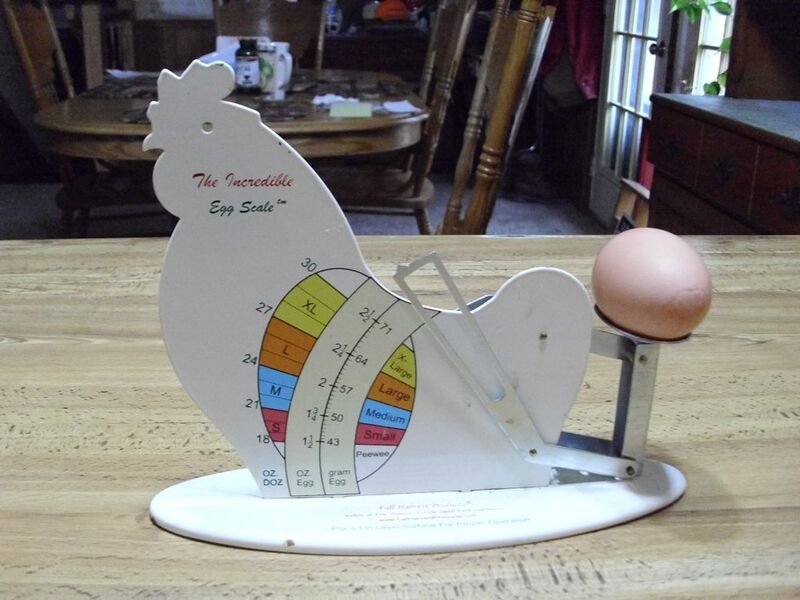 We plan to get an egg scale so that we can size the eggs correctly. In the meantime, seeing our chickens grow and develop is nothing short of amazing. Let me know about your chicken experiences at John@JohnMuellerBooks.com. You may have wondered what happened to the laying hens that I talked about in Sunday Surprise! They have grown up and have become pullets. 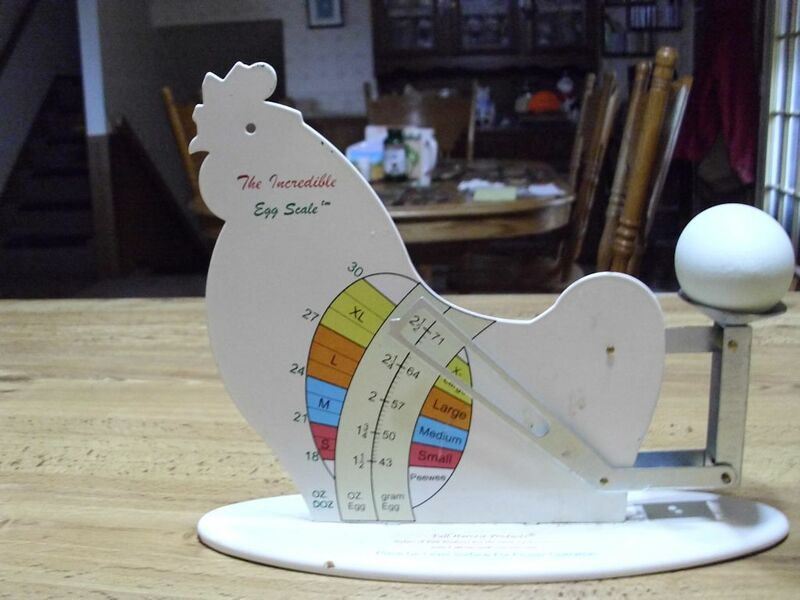 Of course, the question now is what a pullet is and why you should want to know about it. A pullet is a young chicken. Think about it as a teenager—not quite a chick anymore, but also not an adult. A pullet is a chicken that is just starting to experience life and still has more growing to do before becoming a full-fledged chicken. A female chick becomes a pullet when she lays her first egg. She remains a pullet until she is fully grown, which is usually after her first complete moult after she starts laying eggs. The first egg is a lot smaller than a regular egg. 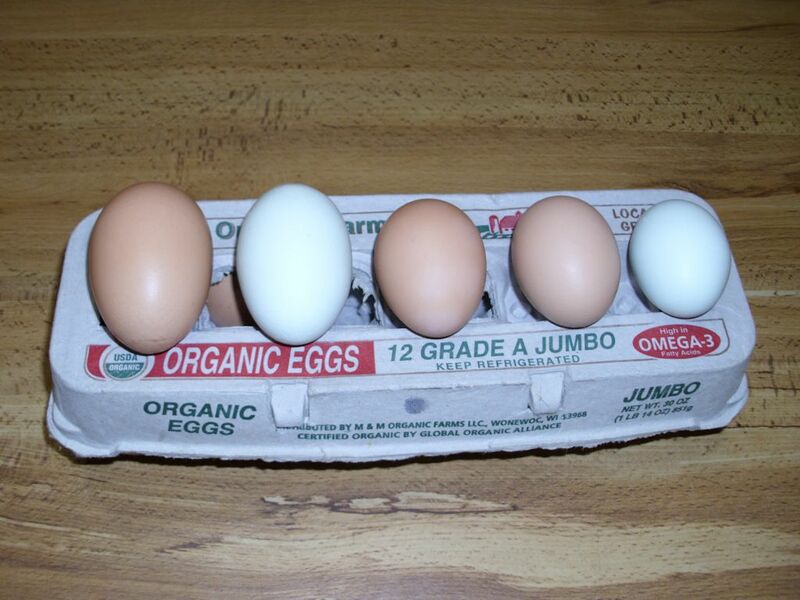 Our chickens will lay large to jumbo eggs. 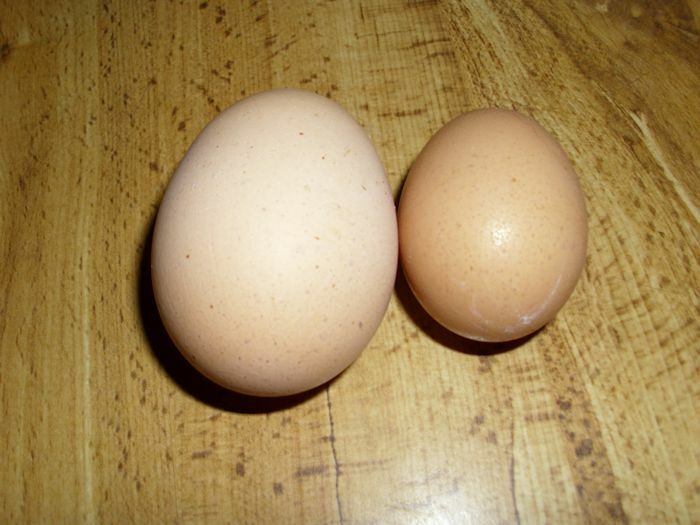 However, the pullet eggs are only about half that size as shown here. On the left is a large egg from Violet, our Black Australorp. On the right is a pullet egg from Rose, our Delaware. Rose’s eggs will stay the color you see here—an extremely pleasing dark brown. The actual egg looks a bit polka-dotted, which is a characteristic of Delaware eggs. As Rose matures, her eggs will become larger. In fact, her eggs will eventually become larger than the ones that Violet lays. Now, here’s why you want to know about pullets. Pullet eggs often sell for considerably less at farmer’s markets. In fact, a local farmer sells them for as little as $0.60 a dozen, which is considerably less than the $1.75 a dozen we pay for a dozen factory-produced jumbo eggs in the store (cage free eggs sell for almost $4.00 a dozen and pasture-fed eggs aren’t even available). You never see pullet eggs sold in stores because people think they’re simply too small to eat or that there is possibly something wrong with them. You do need to know that a pullet egg may not have a yolk—although, all of our pullet eggs so far have had a yolk in them. There is absolutely no difference in taste. However, because pullet eggs always come from a farmer and are likely not from a factory environment, you may actually find that you receive a higher quality product. The statistics quoted for pasture fed chicken eggs, the kind you’ll most likely encounter at a farmer’s market, do differ, but most experts agree that they are better for you. Our coop has entered a new phase with the addition of pullet eggs. It won’t be long now and we’ll have full-sized eggs to meet all of our needs. The eggs will be significantly better for us than anything we could buy at the store. Now that many cities let people raise chickens, have you ever considered producing your own eggs? Let me know your thoughts at John@JohnMuellerBooks.com.